Normally I'm a rational consumer. I buy the things I need with a few new items tossed in for the blog, which keeps my stomach and my wallet happy, but every once and a while there's a deal that's too good to pass up. I was walking through BJ's with all my clipped out coupons, because I don't buy anything from BJ's without a coupon, when I saw a sign. The little paper sign was only a foot off the floor and it said, "clipless coupon" and it had $10 crossed out, and $5.00 written underneath. Five freaking dollars for 44 mini-chocolate-bars? That's like, .12 cents a bar! Girl Scout cookies and candy bars? Yes, please! It was a great deal, and it's been a really tough couple of weeks for me so, completely rationally, I bought three boxes. (One per trip of course over the next few days, in accordance to BJ's policy.) Now that I have 132 mini chocolate bars in my possession, fingers crossed that they taste as good as I think they will! I really REALLY need some chocolate right now, so I'm going to quickly touch on the packaging before I tear into it and stuff my face. 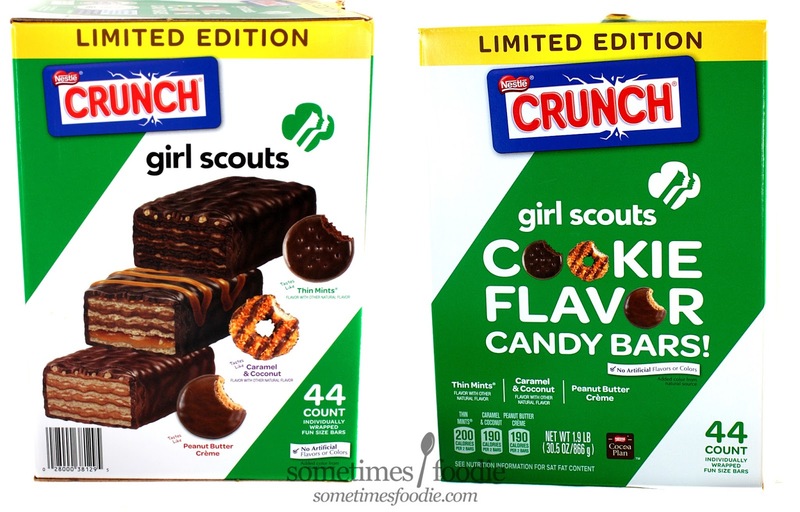 We have a large cardboard box that features illustrations of three flavored candy bars, each one inspired by a super popular Girl Scout cookie flavor. We have Thin Mints, Caramel & Coconut (aka Caramel Delites or Samoas), and Peanut Butter Creme (aka Tagalongs or Peanut Butter Patties). 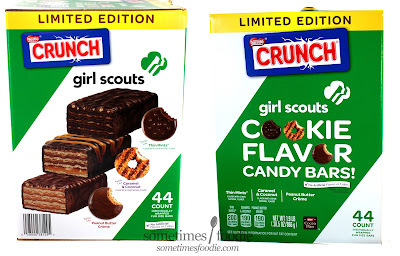 I'm not sure why Thin Mints are the only flavor that gets to keep it's cookie-name, but I'm not going to be super picky about it. The box features the Girl Scout logo, the organizations iconic green and white color scheme, and some basic nutritional information. If the size of the box and the colors don't catch your eye right away, the delicious looking illustrations will. It certainly pulled me in, and these were on the lowest shelf just inches above the floor! Inside the Caramel & Coconut wrapper, you have a dark, but sweet, chocolate coating with a drizzle of lighter, possibly caramel flavored, confection on top. It smells JUST like the real thing, burnt sugar caramel notes with chocolate and a toasty coconut aroma. Oh, so good. I took a bite, and inside we have thin wafers, similar to Kit-Kat bars, with layers of caramel and coconut flavored creme with a few bits of actual toasted coconut mixed in. It's AMAZING! I might like this more than the real cookie! The wafers give this cookie a light crunch which offsets the richness of the coconut and caramel, and I feel like the chocolate comes through more in bar-form than it does with the actual cookie. This flavor is based off my favorite cookie, so I may be biased, but it's the best flavor in the box! 10/10! Next I have the Peanut Butter Creme which differs from the other two. This one is enrobed in a light milk chocolate, not dark. This one smells like a Butterfinger bar, or pretty much any other choco-peanut candy ever. We have little crispies on top, layers of wafer, and peanut butter filling, all mixed with that sweet milk chocolate coating. It's pleasant enough, but there are a lot of similar candy bars like this on the market already, and compared to the other two I wasn't as exciting. It was yummy, and I will certainly eat them without any complaints, but I do find myself reaching around them in the bag, so I give this an 8/10. Easily the best impulsive food product I've bought all year, and it was super cheap to boot! I may not be head over heels for the peanut butter bar, but all three flavors are winners! If you have a BJ's in the area you should see if the clipless coupon is still available, and even if it isn't, these are still worth checking out. 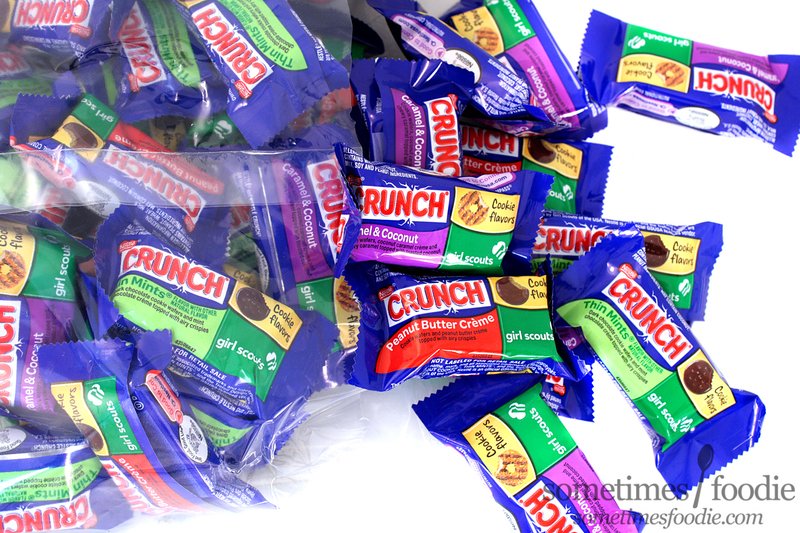 At their normal $10-range pricing each bar comes out to .22 cents, which isn't bad at all, and they're mini bars so it can help you with portion control. They're only available for a limited time, so scoop them up while you can and tell me what you think of them!